At an early age, I developed a detailed eye for design aesthetics and with hard-earned field experience built a successful landscape design, installation and maintenance business in Edina, Minnesota. My passion and attention to detail coupled with individualized client service allowed me to grow the business among a discriminating and financially successful clientele. After selling my business, my wife and I decided to move back to her native Massachusetts and I started Ivy Studio, LLC with the overarching goal of creating a niche design and build studio where the sophisticated homeowner can envision their outdoor expansion dreams. My designs burst with energy yet are grounded and sensible. Concepts are functionally in tune with how modern families live and entertain while keeping within balance of timeless proportion and Classic New England aesthetics. I seek to push ideas to new levels, while bringing them back to ground meeting budgetary guidelines. 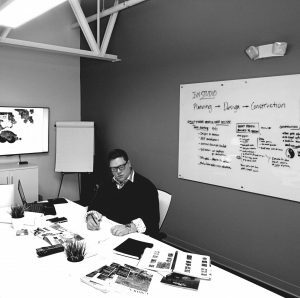 This passion is not only exhibited on the design side, but also in my hand-selecting a team of highly qualified artisans who implement with a passion and overseen by thorough project management. Through intense collaboration with the client and the implementation artisans, we turn ideas and dreams into stunning outdoor masterpieces. Luxury Outdoor Living to me is creating an environment where memories are made for a lifetime. I personally invite you to call me to begin a conversation to start the journey.